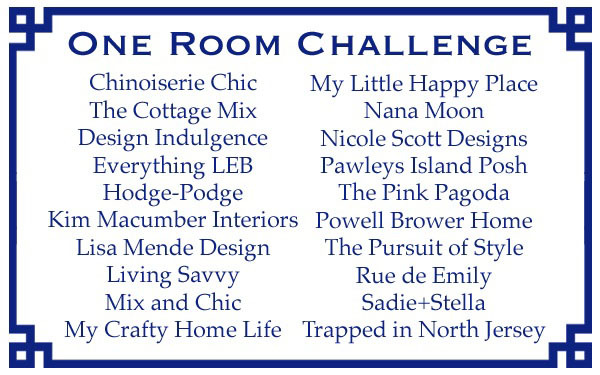 Okay so it's reveal day here for the One Room Challenge. 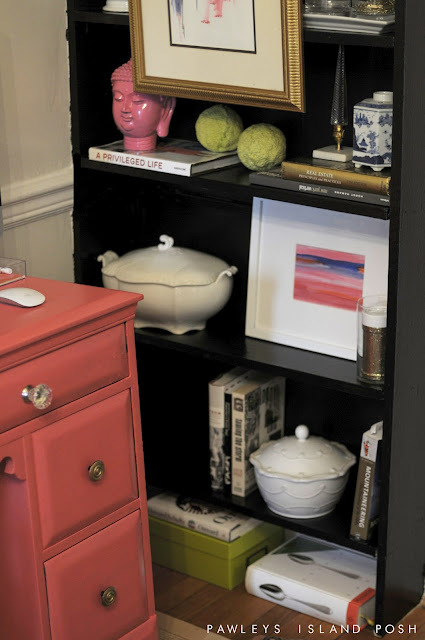 I listened to your sweet encouragement and painted the built-in bookshelves glossy black and gave the desk some nice coral action. But I'm actually en route to Pawleys Island so I'm apologize for the picture overload. I was too tired while typing this up to choose my favorite angle. Today is just the pictures but I'll be back next week with a details post and source information so feel free to ask any questions in the comments section and I'll try to get them answered. 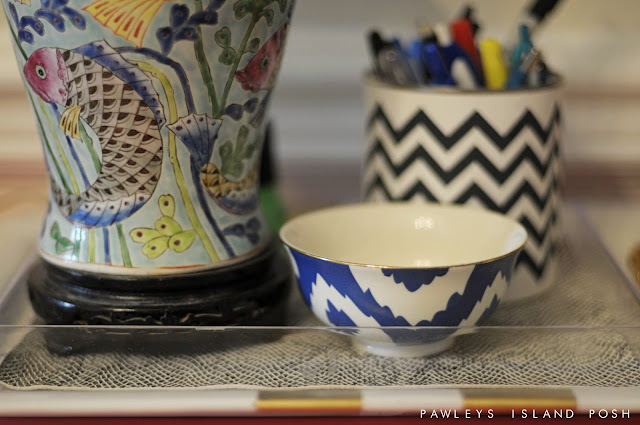 I've already gotten two requests for a painted desk tutorial. That will come lovelies. Be patient. Good things take time. Don't fool yourselves, spray paint was not used in the completion of this project. Nothing short of hard work and paint rollers. Feel free to start at the beginning of the One Room Challenge here. Now get your butts over to the other ladies to see their big reveals too! It. LOoks phenomenal!!!! Omg!! So awesome. Time crunches work for you! Everything looks amazing. Great job Julia! Oh my gosh! You nailed it! Pinning! Great job Julia! I love the black bookcases and your creative space to work is SO FUN!!! Have a great vacation..
ADORE! The desk and bookshelves are beyond!!! Such a great job!!! Bam, Bam, Bam...it is crazy good! I love all of the details you did. That seat cover, the tiny dish, your artwork....it feels so sophisticated and happy. Well done! Oh my gosh, oh my gosh, oh my gosh!!! It looks so freaking awesome Julia! Aren't you so glad you went for it on those bookcases? They are killer! 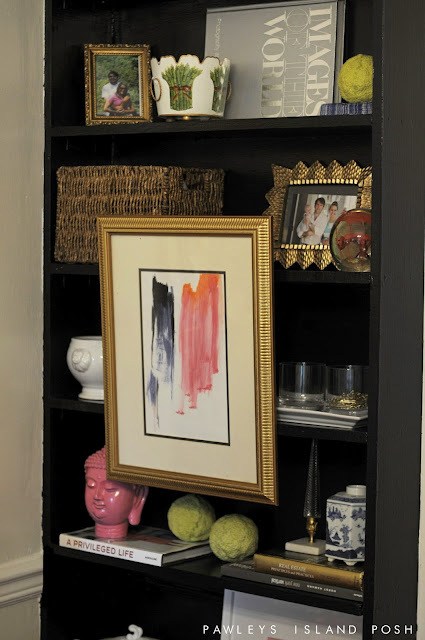 Especially love the framed art hanging on it. And don't even get me started on the blog header - I squealed a little when I saw it. LOVE EVERYTHING!!! You work well under pressure girlfriend! I think it turned out amazeballs!!! LOVE. Now go enjoy some beach time! This is amazing! I love all the colors you tied in and they do pop BAM with the black on the shelves! Well done and you deserve a little R&R ... enjoy your time away! You totally nailed it! The black shelves make such a difference and I love the contrast with the coral. What a transformation! Wow what a great final result. Your office looks amazing and I'm so impressed with your painting...what a difference. Your shelves seem happier in gloss black...dont' cha think? Looks beautiful! 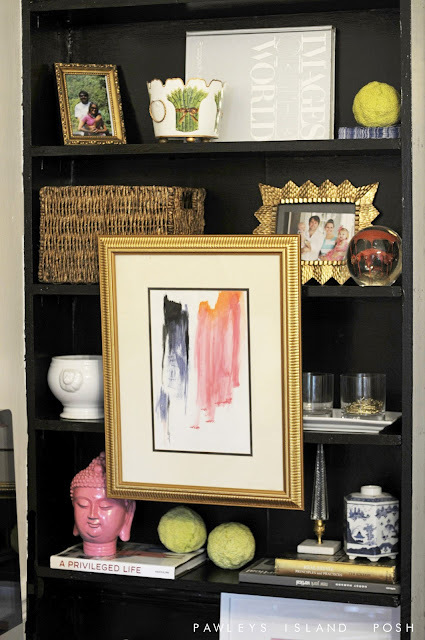 I love how you styled the bookshelf.. love the painting too (the one front and center. Did you paint it? Totally in love with the black! You totally rocked it! And the coral is insane! 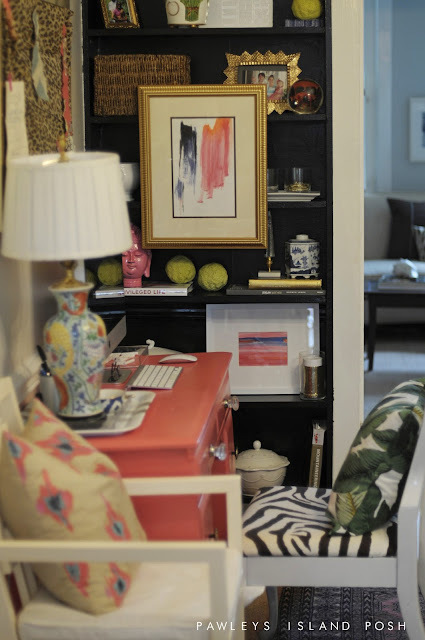 WOW - those bookcases and desk really do great things together. 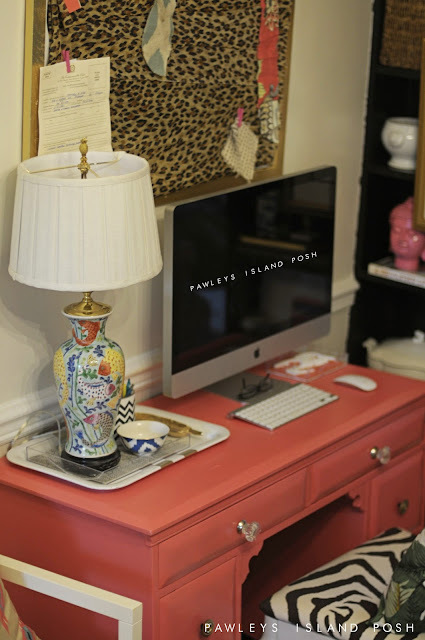 it looks great styled and all put togehter - so glad you went bold. GREAT JOB MY FRIEND!!!!!!!!! You never cease to amaze me. 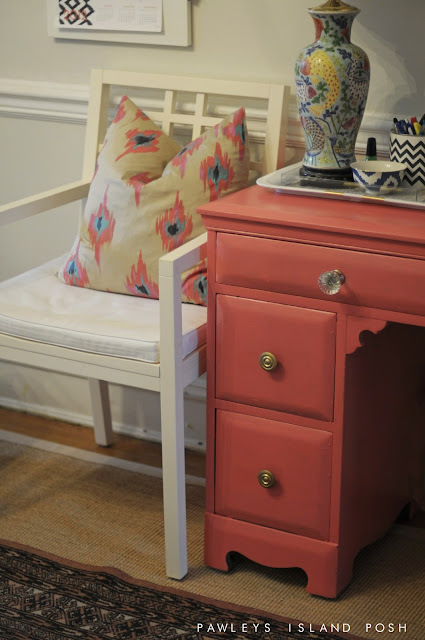 I am in love with it and wondering if I have the courage to paint my next set of built ins. Seriously considering it now. It is perfection. Stunning! Great job, Julia! I am so excited to see those black bookcases. 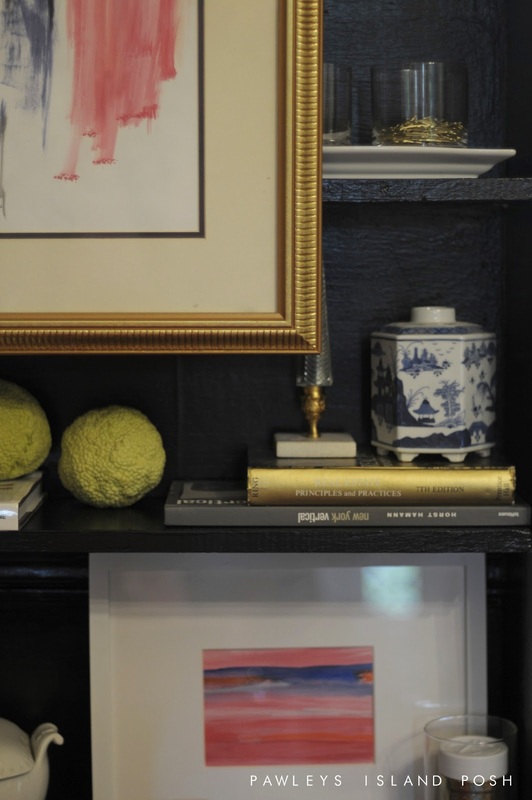 The staging is wonderful and the accessories really pop against that black. Yah! Enjoy your down time on the island! Julia, this looks amazing! You did a fantastic job! Love that color on the desk! Hi Julia! Have you already posted somewhere where you got the occasional chair (the one with arms)? Is it comfy for use in an office? THis looks amazing! The black with the coral--genius! I wish you lived closer so you could help me decorate my nursery! That looks great! You're always so great at mixing patterns and working with colour. Such a pretty place to sit and do some work! It looks amazing! I love how all the colours work so well together. You did such an amazing job! Enjoy your time at the Island! I am impressed you watermarked all the photos. I was too tired to do so! to redo my office and this is great inspiration. Going black was such a great idea- I really love how it makes everything you have on the shelves stand out. 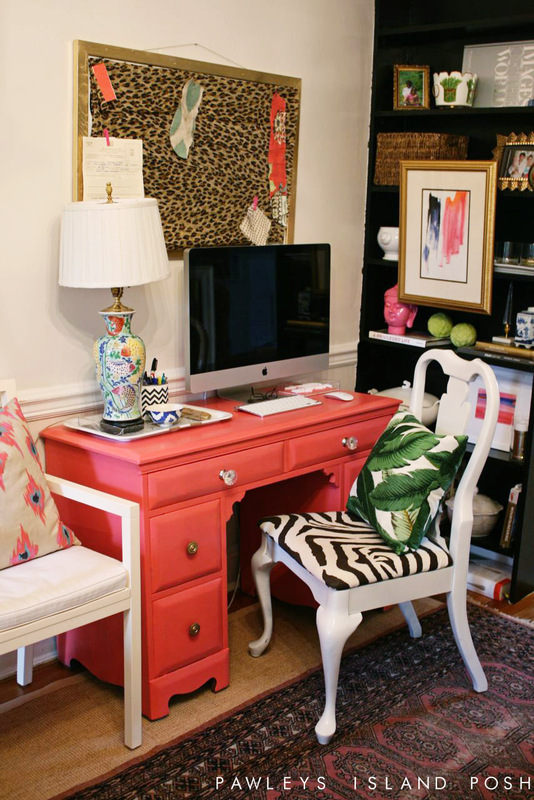 And dont even get me started on that desk, the color is beautiful!! Love your new office now! First... I'm obsessed! LOVE it all! 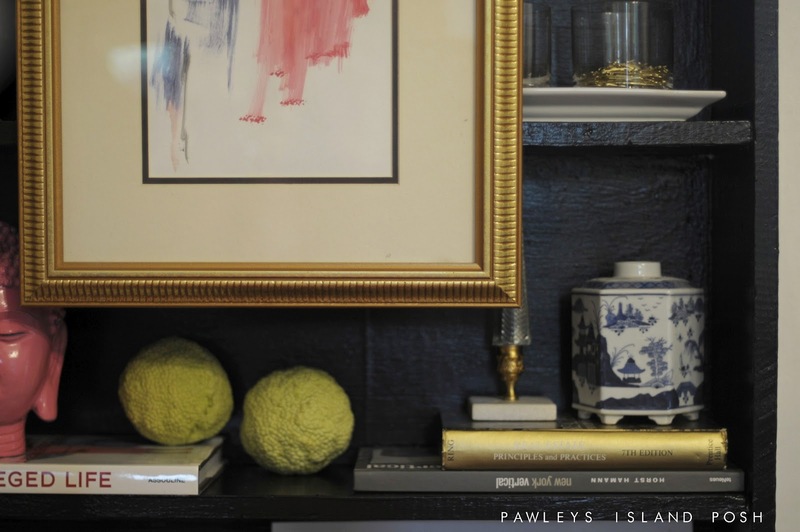 Second, i just got back from 2.5 weeks at Pawleys where our family has a house (right in the middle of the island - The Anchors-) and I'm super jealous you are headed there. I'll be back in a couple weeks. 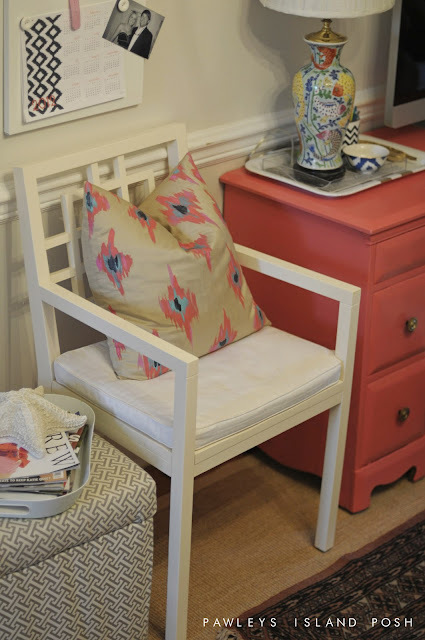 I'm sure you go to Currents, the furniture store off the island... they were AMAZING as usual! BAM! Is right! Hello beautiful colors! Your desk color is perfectly matched with that Ikat pillow. Beautifully styled room. I LOVE the BAM! I think it looks fantastic, especially the black shelves. What a lovely little space to call your own. Whoa.Seriously AMAZING job! You're so talented with color!! I love it all...won't even try to lists specifics. Enjoy the beach, Julia! It looks GREAT! Love how it turned out. The black bookshelves look fabulous. Your styling really pops from them. Your coral desk is the best--love the drawer pulls. 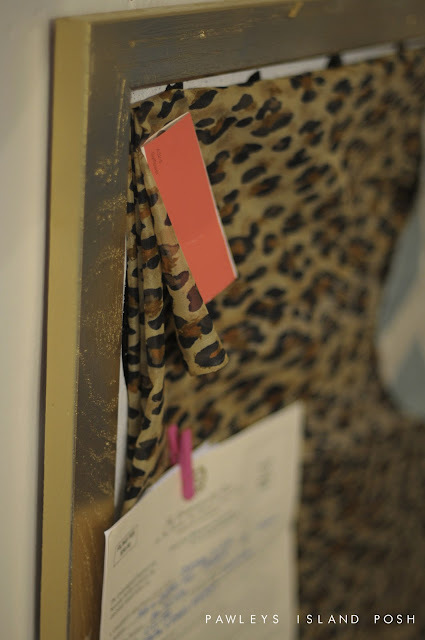 The animal print really adds dimension. Great office! Great job! Omg! It looks freakin' amazing. Totally looks professionally styled. Great job! Looking gooood gurrrrl! You killed it! Seriously. Your styling is my favorite part- so perfect. It looks so fab, Julia, I just love your style! Fun, tons of personality, pulled together, bold - I don't know how you do it. And with two babies in the house. And in 6 weeks!! Enjoy your new space - it's divine! It looks fantastic Julia! 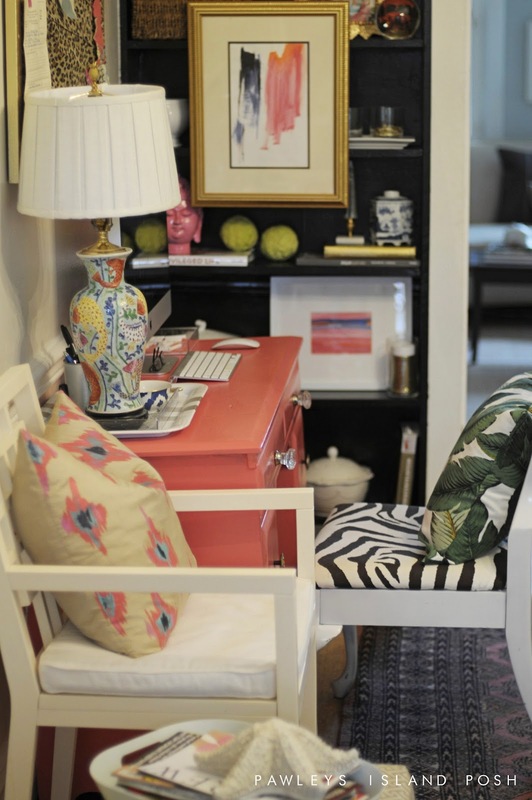 Love all of the color and different prints and fabrics. You put it together beautifully. That coral desk is really a fun piece! girl this looks amazing!!!! cannot wait to discuss all the fabulousness over lunch Sunday!!!!!! Completely beautiful. 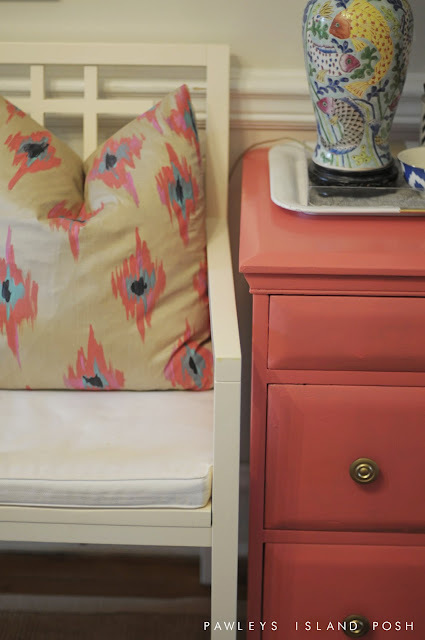 Adore the color palette and the styling. Oh, and the art, too. Great great job! So beautiful! Came together just like you had envisioned, better even. Congrats on believing in your initial creative instincts and following through. It paid off in a BIG way. I'm madly in love with your new office. The fabrics and colours you used are fantastic! Wow- this reveal is amazing! 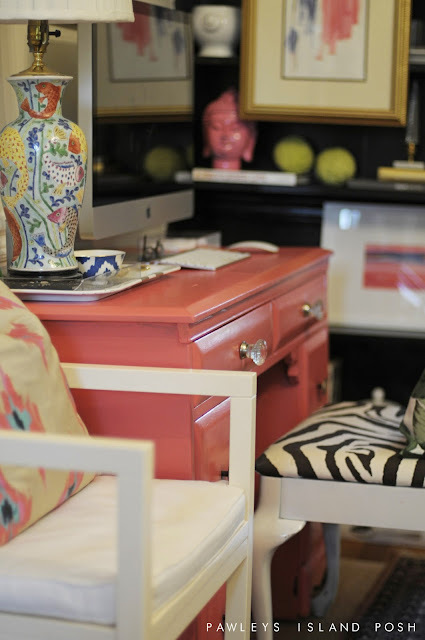 I love all the color and pattern. The shelves look great painted black. It makes the art really pop! Wow!!! The reveal is grea, you did such a good job! I cannot get over the coral and black, loving it together! It's effing awesome love bunny. So proud of you. And that little artiness you put up, well I saw that pretty thing on pinterest too and tried to do a version but i lost track of what i was doing and it turned out like shitballs. Yours = loveliness. 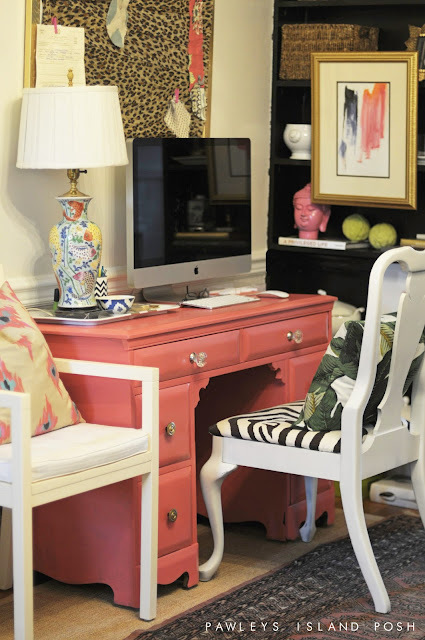 LOVE all the colour - that desk is fabulous! 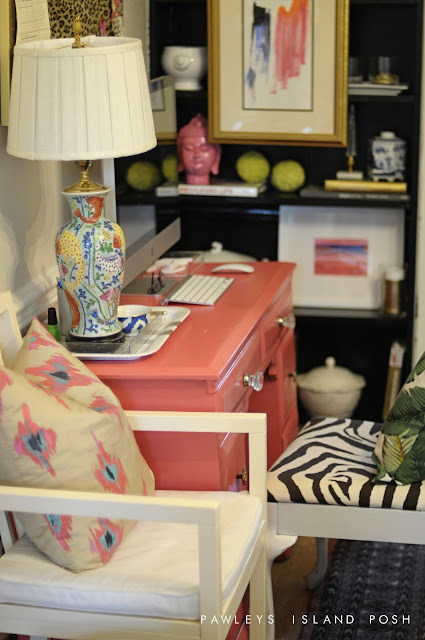 Wow- I love your use of color and the way you merchandised everything!! So pretty! I really LOVE LOVE it!! 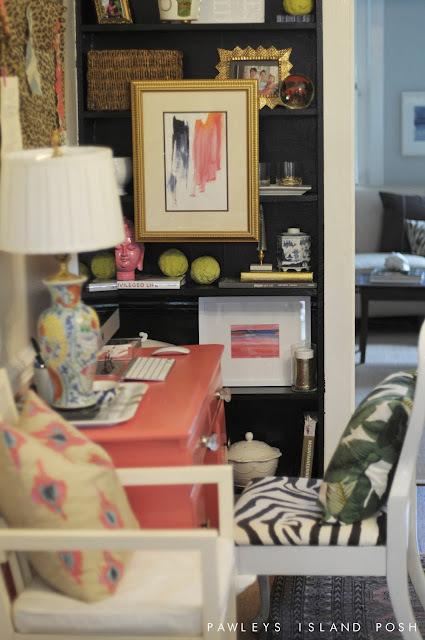 Love the black bookcases and the coral! So pretty! This was such a fun challenge to be a part of...I never knew 6 weeks could pass so quickly!! I'm trying your BBQ chicken pizza this weekend. Looks delicious! The black bookcases are beautiful! 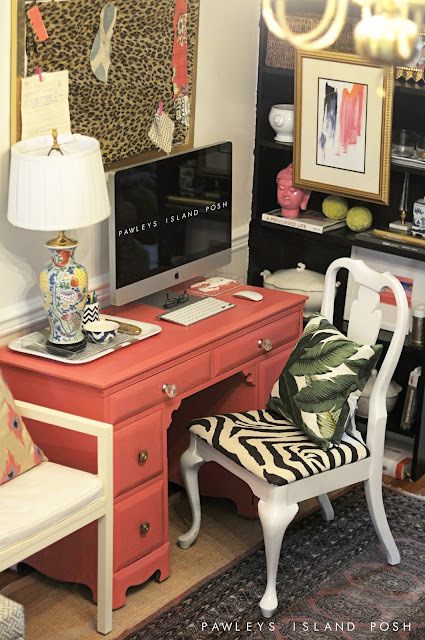 Your styling is awesome and the coral desk is very pretty. You did a great job, Julia! This space is amazing. All the colours work so well together! love it! HOW have I not seen this until just now?? Decorgasm. Brilliant. OH MY!!! 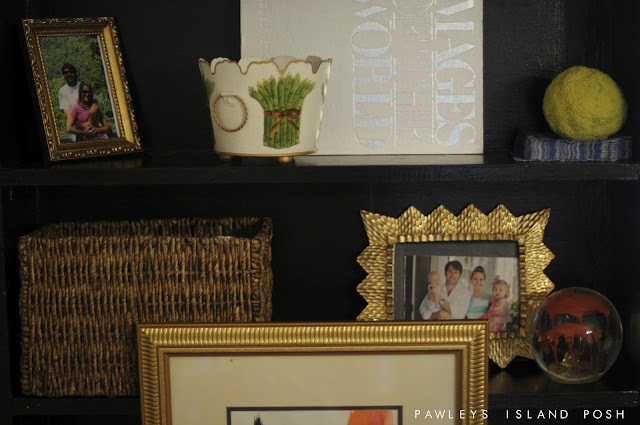 I love it--especially the lamp, zebra chair, artwork, and that gold frame your family photo is in! I love this so much!!! looks amazing!